Steven (Chicagoland, United States) on 5 April 2013 in Architecture and Portfolio. Designed by famous architectural partners Burnham and Root, the picturesque Rookery in Chicago was originally completed in 1888. Adding to its impressive stature, Frank Lloyd Wright redesigned the stunning two-story, skylit atrium in 1905. 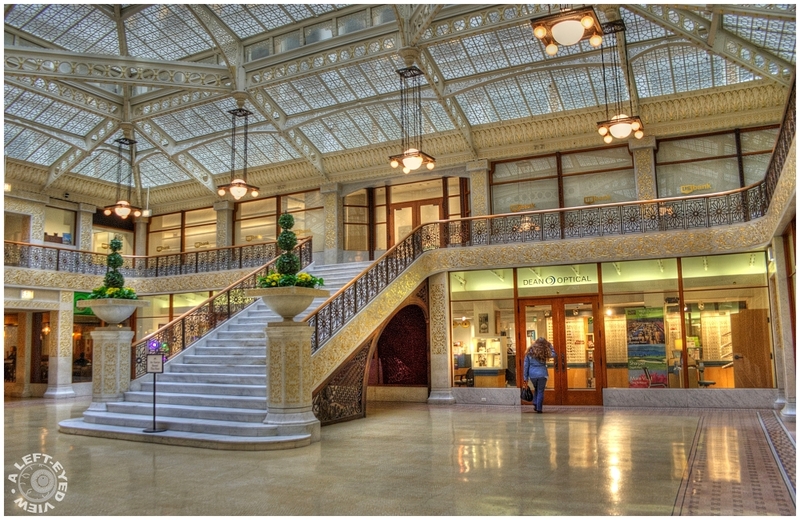 Meticulously renovated and maintained, the Rookery Building was designated a Chicago Landmark in 1972 after being added to the National Register of Historic Places in 1970. Photo captured March 8, 2011. Beautiful capture of the light and exquisite architecture! great sharpness and details ! A gorgeous interior. I love all the detail in the roof structure. Beautifully photographed, what an amazing work of architecture and design. Thanks for sharing. Wunderbare Architektur, Licht und Spiegelungen. Wonderful interior image. The light and the details are gorgeous. I never went there so I have to return one day. A magnificent piece of architecture. You have captured its beauty wonderfully. Wonderful architecture and marvelous details! A beautiful capture Steven. This is wonderful Steve ... terrific processing. Gorgeous detail, wonderful lighting. I wonder about the woman in blue. Since she is the only human in the scene, did you wait for her? Place her? Accidentally include her? Wow! It is gorgeous! I love the architecture! Just beautiful! A wonderful interior, perfectly taken! That is a gorgeous image and interior ! I love the quiet here and the whole image. Beautiful interior capture and lovely design and well lit! That is such beautifully ornate staircase. Gorgeous interior, perfectly shot !